Mary Beale was a prolific, successful portrait painter but her name is little known outside experts in 17th Century English painting. As such, Mary is perfect for celebration in the We Are The 51 campaign to celebrate the achievements of women. Mary Beale was born in Suffolk, daughter of the rector of Barrow, who was himself a keen an amateur painter. Mary’s father introduced her to her future husband, Charles Beale, also an amateur painter. They married when Mary was eighteen and the pair lived together in Covent Garden and later in Fleet Street. Charles was a clerk in the patents office when Mary began to study portraiture under Robert Walker. Mary and Charles left London for Hampshire, as plague swept through the city but as Mary’s fame grew, they returned and she set up a studio in Pall Mall. Charles left the Patents Office and went to work with Mary to prepare her canvases, mix her paints and keep the records. One such record shows that in a single year she completed 83 commissioned works. Mary and Charles had three children; a son, Bartholomew, died young. A second son, also called Bartholomew, painted portraits before taking up medicine. A third son, named Charles after his father, was also a painter, specialising mainly in miniatures. Mary had a wide clientele from among the gentry and aristocracy, and from their own distinguished circle of friends, who included fellows of the Royal Society and puritan clergy. Mary Beale was supported in her career by Sir Peter Lely who, as the court painter, had already influenced her painting style. The notebooks kept by Charles record that Lely visited her in her studio and ‘commended [her] extraordinarily’. Later Lely allowed Mary to study his own painting techniques, and she was able to build up a lucrative trade from making replicas of his portraits, though she toned down his erotically-charged depictions of court beauties in her own portraits. 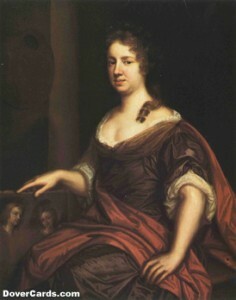 One of her portrais is of prolific writer, Aphra Behn. Their close friend Samuel Woodforde described Mary as a “sympathetic and hospitable friend”, while the puritan nature of their household is indicated by the family’s practice of regularly setting aside 10 per cent of their annual income for the poor.